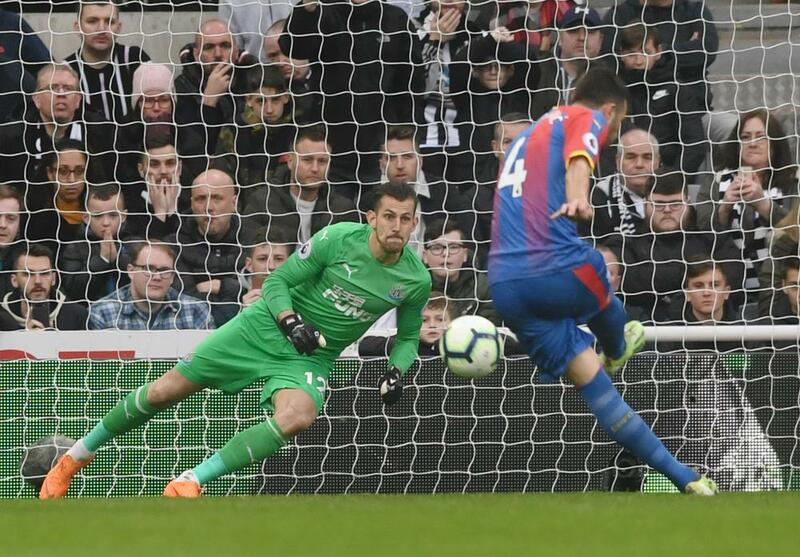 Luka Milivojevic's late penalty earned Crystal Palace a barely deserved 1-0 win at Newcastle United to all but secure its Premier League safety. Relegation remains a mathematical possibility, but appears only a distant threat after Roy Hodgson's side moved 11 points clear, four ahead of its hosts. Magpies boss Rafael Benitez revealed in the build-up to the match that he was waiting for confirmation over his future at the club, but may face a further delay until the Magpies can secure their own top-flight status. Both sides had a goal disallowed in the first half, with Salomon Rondon and James Tomkins the frustrated parties, although replays showed the officials were right in both instances. With Newcastle having won its past five in a row at home, hopes will have been high among its fans for a late winner, but it did not go the way as expected, with an injury to Florian Lejeune giving further cause for concern. Vicente Guaita breathed a sigh of relief after spilling a cross into the path of Rondon, whose goal was ruled out for offside. Matt Ritchie called the goalkeeper into action again at the end of a swift counter-attack as the hosts continued to pose the greater threat. It was not all one-way traffic, however, and some tricky wing play from Wilfried Zaha threatened to unpick the home defence, who eventually dealt with the cross as James McArthur was lurking. There was still time for Guaita to repel a low Rondon effort and Palace to have a goal of their own chalked off with McArthur deemed active in an offside position when Tomkins stroked home. The hosts lost Lejeune, who underwent knee surgery last August, to what looked to be a serious injury in a closing 30 minutes that took another turn for the worse late on. DeAndre Yedlin's foul on Zaha allowed Milivojevic to net his 10th penalty of the season with Palace's first shot on target. It has been the primary objective for both these sides to stay in the Premier League, and Cardiff City's loss at Manchester City in midweek means this was a huge win for Palace, and a defeat that leaves Newcastle in much the same position.